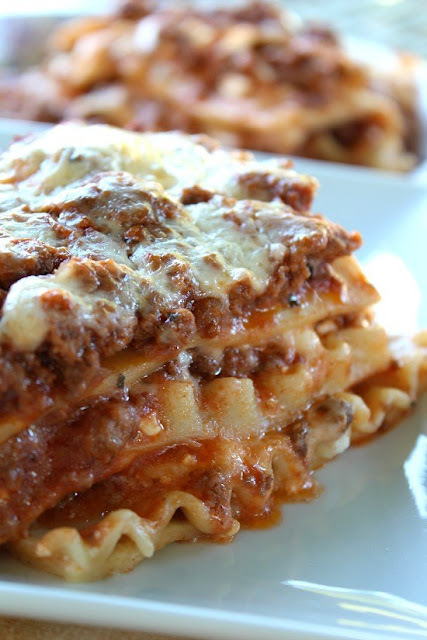 This homemade classic lasagna recipe is absolutely delicious and one that will be requested over and over. A perfect comfort food that satisfies those pasta cravings, those cheese cravings and it’s an easy lasagna recipe to prepare and the leftovers are to die for! It’s even better the second day. Loaded with gobs of cheese, from the mozzarella cheese, to the cottage cheese (can substitute Ricotta cheese), to the Parmesan cheese, this is one cheesy lasagna recipe everyone will love. You can also add more mozzarella cheese if you’d like it even more cheesy. Like I’ve said many times, you can never have enough cheese. Final layer is pasta, remaining meat mixture and remaining mozzarella cheese. Cover with foil and cook for approximately 50-60 minutes. Remove foil and cook for an additional 10 minutes. 0 Response to "CLASSIC LASAGNA"